This is why one should stand still when taking photos. I was in a hurry to capture the scene and snapped the shutter while I was walking. Luckily, I took two shots and I came to a complete stand still before snapping the shutter the second time. I will share that pic tomorrow in my apple picking post. See, Thom, this really is a muffed photo! 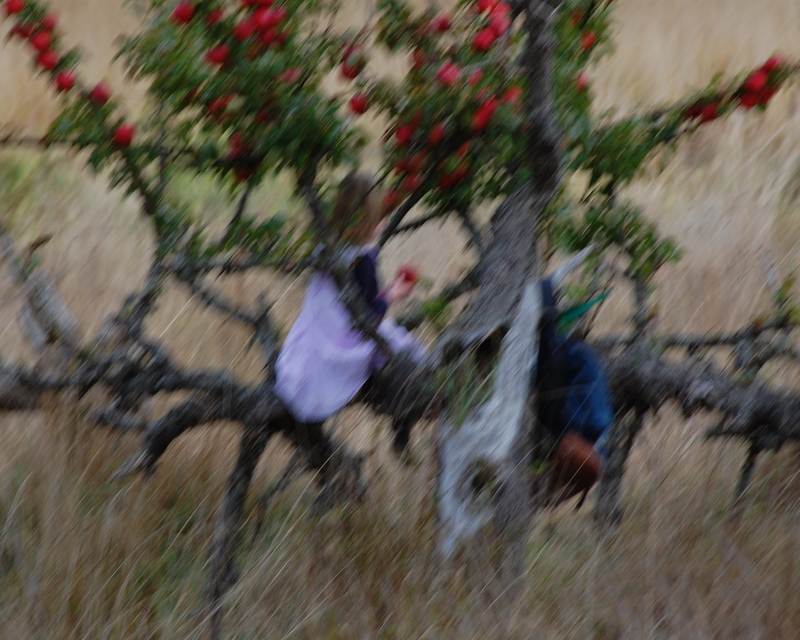 That’s a little girl sitting in an ancient apple tree! Pink — it is kind of pretty in an abstract way, but looking at it makes me dizzy! Quilly, this makes me feel like I need to blink really hard a couple of times to clear things up — but nothing happens! Thanks for sharing! Looking forward to the still and clear version tomorrow! Kelley — I know exactly how you feel. Looking at this pic kind of makes me sick to my stomach. I did make out the little girl, and, wow, the apples look red and ripe! I agree with what Pink and Kelley said — it almost looks Impressionistic but does make you feel you need to blink to clear things up. Barbara — I have pics of apples that will thrill you! Impressionism comes to photography! Or I need my eyes checked again. I can see apples, so I’m looking forward to your apple post! Karen — you may need your vision checked, but don’t base that decision on this photo! LOL! Whowa, I’m fighting a migraine – that picture didn’t help! LOL Can’t wait to see the real thing! Sorry, Linda — if you’re having migraine issues, you shouldn’t be looking at the computer screen! And, I recently read in “Eat This & Live! For Kids” that many frequent headache and migraine sufferers find relief from their symptoms when they increase their daily water intake — clear, clean water. I like this photo. It looks like a painting. Thanks, Betty. This photo does have a bit of charm, but I think once you see the focused shot you’ll agree it is much better! Akelamalu — today is tomorrow, sort of …. Quilly I love the concept of it…like modern art. : ) Apple picking is one of my fav Fall things to do. We are pretty much at end of picking season now here on the big island east coast, but I am baking a lot with apples from the farm stands. Thanks for sharing this. Kathy — apple eating is one of my fave fall things to do! Believe it or not, we didn’t keep any of the apples we picked! WOW! I just saw the rest of the photos you posted, including the one that came out great (not like the reject). Great shots! I love the lighting there. Have a great day! It’s really kind of pretty. It makes me think of the Impressionists. Kind of like looking through a wet window. Thanks, Ace. I think the bright colors are what makes this blurt intriguing.